For more information related to mutual fund investments and to get the similar updates like this keep visiting MySIPonline. Probably, the biggest-ever fraud in the history of banking was unfolded this week. The Rs 11,400 crore Punjab National Bank (PNB) scam has landed the whole banking system in trouble, as the country gasps at the sequence of events that has happened till now. The recent Valentine’s Day has left a bad taste in PNB’s mouth. The Mumbai branch of PNB uncovered the alleged fraud of Rs 11,400 crore that associates the name of the billionaire diamond jeweler, Nirav Modi, his wife Ami Modi, brother Nishal Modi, and maternal uncle Mehul Chinubhai Choksi, as the beneficiary in the connivance. On Wednesday, the bank (PNB) disclosed that two of its employees had connived to provide the Letters of Undertakings (LoUs) to the Nirav Modi’s diamond jewelry chain since 2011. The shares of Punjab National Bank have dived off to hit the new 52-week’s low on this news. The sentiments have also influenced the shares of the other lenders, as the probability of involvement of the other banks has been suspected in the scam. But the mutual fund schemes might not get affected by the market plunge as the investment in PNB by them is unsubstantial. What Is the Fraud All About? The second largest PSU bank of India, Punjab National Bank (PNB) has allegedly exposed the fraudulent issuance of LoUs by two of the bank employees by relaying the instructions on Society for Worldwide Interbank Financial Telecommunication (SWIFT). The plot involves the transmission of SWIFT messages to the offshore branches of the other Indian banks to raise credit for the buyers of the companies related to the diamond jeweler Nirav Modi. Against the code of Letter of Credit (LC), the requests of LoUs were entertained without establishing any entry in the Central Banking System (CBS). The amount of the alleged con is more than the double of Rs 5,473 crore, as stipulated by the government under bank recapitalization plan last year. Letters of Undertaking or LoU is a form of consent issued by one bank to the foreign branches of other Indian banks that assures to discharge liability on its customer’s behalf. They are termed to be for 180 days as per present RBI norms and can be rolled over once for a 6-month period. The process of issuing LoUs is backed by some security which uses SWIFT instructions. These messages are transmitted from bank to bank following rigorous three-layered checking mechanism comprising a maker, a checker, and a verifier before it’s sent across. The popular diamond jeweller Nirav Modi’s firms – Diamond R US, Solar Exports, and Stellar Diamonds – have been accused of approaching PNB with a request to allow buyers’ credit for paying overseas suppliers and apparently conniving with two of the bank employees to obtain credit based on the fake LoUs. On 16th Jaunuary, the bank demanded for 100% cash margins for issuing LoUs, which was contested by the Modi firms saying they had availed the same facility without cash margins from as early as 2010. This instance has provoked the questions on the integrity of the bank’s system. In reaction to the hoax, PNB has approached both CBI and Enforcement Directorate (ED) to probe Modi for alleged cheating and fraud involving Rs 11,400 crore at their Mumbai branch. Apart from that, PNB has suspended 18 of its employees and has specifically named the ex-deputy manager Gokulnath Shetty and another official Manoj Kharat. ED has searched several properties related to Nirav Modi, the chairman of Firestar International, and the founder of the Nirav Modi chain. According to reports, ED has seized assets worth Rs 5100 crore in this case. Other than Nirav Modi Group, three well known jewelry brands, Gitanjali Gems, Nakshatra, and Gili India are under scanner with ED and CBI. As of now, PNB has sealed the lips over the list of affected peer banks but some of lenders like Union Bank of India, Allahabad Bank, and Axis Bank have acknowledged to have extended the credit based on LoUs issued by PNB. How the Fraud will Hurt Mutual Funds? The shakedown will prompt the banks and insurance companies to be strict on credit limits. But the immediate effect is reflected on the shares of Punjab National Bank since the news has floated. The share prices of Punjab National Bank are down by 2.10% even today. Although there is not much to worry about as scarcely any mutual fund scheme has significantly invested in PNB. But the plunging prices of its shares will directly affect the mutual fund schemes that are bearing PNB stocks. As we tried to dig out the figures, we found that HDFC Mutual Fund holds the highest - 4.48% stake in the scam-hit PNB as of January 31, 2018. Let us find out the equity mutual fund schemes that have a comparatively significant exposure to the shares of the PNB. Beside these numbers, data on BSE shows that out of around 243 crore outstanding shares of Punjab National Bank, HDFC Mutual Fund holds 10.8 crore shares. 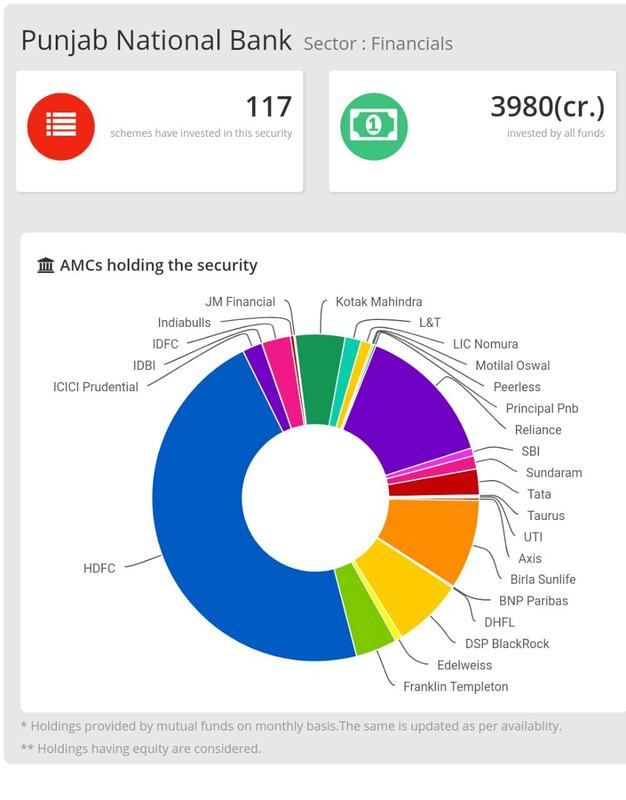 Moreover, out of the 117 mutual fund schemes that invested in PNB only two banking ETFs have allocated over 9% of their AUM in the stock. They have no choice over it as ETFs are mandated to invest in the constituent shares of their underlying benchmark in the same proportion. What Should Mutual Fund Investors Do? At prima facie, the scenario may seem to worsen as more revelations come into light related to the PNB scam. But investors are advised to understand the risks involved with investing in a sector-specific ETF. The mutual schemes might get affected by the sentimental stir in the market but will not degrade the performances by more than 1% - 2%. The long-term goals of the funds are expected to remain intact as the fund manager may take a call to rebalance the portfolios of the Mutual Funds. MF investors must not worry and retain their faith in the fund managers as they must have worked on the strategies to deal with the chaos as the scam unfolded.